There was a particularly moody smattering of clouds hovering above downtown Los Angeles as I crept slowly along the 101 South. After weeks of dealing with nonstop rain, I was beginning to feel out of place in our reliably sun-soaked city. But as soon as I stepped foot in the space where we were shooting with Erica Cloud, I felt as though someone had dialed up the saturation—my mood lifted almost instantly. I turned a corner to find an energetic Cloud standing next to a rack of clothes holding pieces she had pulled for the day’s shoot. Electric neons fused with rich earth tones and softer pastels. If the thought of such an uncanny mashup of colors makes you nervous, you'd be in good company, but Cloud is somewhat of a savant at styling color, so she breezed through the rack like a natural. “I think about [color] a lot because I think it actually loans to confidence,” she muses, acknowledging the transformative quality it can have. “People are scared of it until they put it on.” Though she’s never one to shy away from a statement color (or three), she admits that for us civilians, wearing bright colors can be intimidating at best and truly fear-inducing at worst. This is precisely why we tapped Cloud in the first place: to show us how to wear the spring colors we (and our readers) agree are most polarizing—neon green, orange, and chocolate brown, to be exact—and be able to pull them off like we know what we’re doing. Speaking with her, you get the sense that this decisive nature has contributed to her overall success as a stylist, and it’s apparent in every choice she made during our shoot today—she didn’t hold back even one bit with her color choices. If you’re skeptical like I was, she recommends taking into account differences in warm and cool undertones when choosing the right shade of orange for you. But on the whole, a true orange, like the top she chose for this look, is, in fact, universal. If there was still doubt left in my mind on the color, witnessing the expert combination Cloud composed in this second outfit dispelled what remained. “Chocolate brown is such a luxurious shade," she admitted. “I wanted something that was luxurious because I think it can go a little muddy otherwise.” That reasoning led her to choose this blouse from The Row, which she thoughtfully paired with colors in the same family: cream trousers that lifted the heaviness of the brown and a burnt-orange blazer. She admitted that most people would avoid putting an orangey-red with a brown, thinking it to be too much like a mood board for the month of November, “but that’s why you have to cut it with a neutral or a lighter color,” she advised. Cloud makes it sounds easy enough, yet this rich shade of brown is still uncharted territory for the vast majority of people who dwell in the safety of balancing literally any color with black (ourselves included). Just as she’s about to step in front of the camera, Cloud shares a seemingly mundane anecdote that’s actually quite telling. She pulled out her phone and showed me photos from a Crayola-themed party she hosted on her most recent birthday where all her guests were tasked with wearing a single color of their choosing (just no white or black) from head to toe. 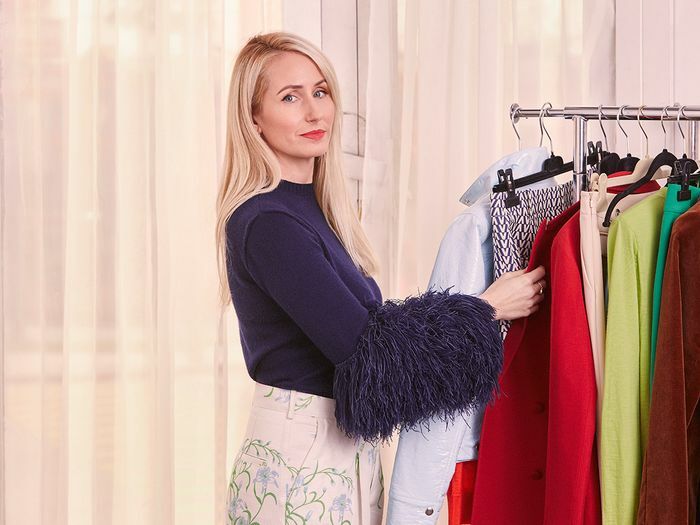 “Most people have a tendency to buy a certain color they really love,” she says knowingly, “so even though they’re scared of trying it, they’re already subconsciously doing it.” For someone who’s built an entire career on her ability to pair and combine clothing in a way few others can, Cloud certainly has a habit of doling out her expert advice freely.